Cholesterol and saturated fat don’t cause heart disease. Heart disease is the #1 killer. However, traditional heart disease protocols have gotten it all wrong. Science is showing that cholesterol and saturated fat are not a direct path to heart disease - and that the standard prescription of low-fat diets and statin drugs are contributing to a health crisis of monumental proportions. Acclaimed authors Jonny Bowden, Ph.D., C.N.S., and Stephen Sinatra, M.D., F.A.C.C., reveal the shoddy science, manipulated research, and corporate greed that has perpetuated the myth and reveal the true culprits of heart disease – including sugar (not fat), inflammation, stress, and high-carb diets full of processed foods. 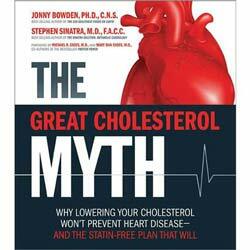 Based on the latest studies and clinical findings, The Great Cholesterol Myth provides a statin-free plan for preventing, managing, and reversing heart disease and staying healthy for life. Stephen T. Sinatra, M.D., is a board-certified cardiologist, a certified bioenergetic psychotherapist, and a certified nutrition and anti-aging specialist. At his practice in Manchester, Connecticut, Dr. Sinatra integrates conventional medicine with complementary nutritional and psychological therapies to help heal the heart. He is an assistant clinical professor at the University of Connecticut School of Medicine, and is the author of several books, including "Optimal Health," "Heartbreak and Heart Disease," "Heart Sense for Women," and "Eight Weeks to Lowering Blood Pressure." Jonny Bowden, Ph.D., C.N.S. is a nationally known expert on weight loss, nutrition, and health. He is a board-certified nutritionist with a master’s degree in psychology and the author of twelve books on health, healing, food, and longevity, including two bestsellers, The 150 Healthiest Foods on Earth and Living Low Carb. A frequent guest on television and radio, he has appeared on CNN, MSNBC, Fox News, ABC, NBC, and CBS as an expert on nutrition, weight loss, and longevity. He is the nutrition editor for Pilates Style, and is a regular contributor to Clean Eating, Better Nutrition, and Total Health Online.